Itchy eyes, or ocular pruritus, are a common symptom of many eye problems. One of the conditions they are most associated with, however, is allergies. But just because you have an allergy or are allergic to something doesn’t mean itchy eyes will be your indicator of the presence of that allergen. Here’s a look at which allergies tend to cause itchy eyes. An allergy is a faulty immune system response. Essentially, when you come into contact with a particular substance -- whether that substance is peanut butter, wasp venom, or grass -- your immune system marks it as dangerous. From then on, when you come into contact with it your body produces antibodies, despite the fact that the substance on its own likely won’t do you any lasting harm. The irony of allergies is that your body makes whatever it is dangerous. This might be a range of symptoms -- itchy hives, a stuffy nose, or complete anaphylactic shock. The symptoms the different allergies present depends largely on what type of allergen it is. According to the Mayo Clinic, food allergies, from fruits to nuts, generally affect the mouth and throat, such as a tingling sensation; the lips, tongue, throat, or even whole face may begin to swell. However, food allergies may also incite hives -- on the face or spread around the body. If you are allergic to certain insect stings, getting stung might mean a large swollen area where the sting occurred, itchiness, or hives. Insect stings can also make breathing difficult, making your chest feel tight or causing wheezing. Many people are allergic to medications, even common ones such as penicillin. Since the goal of most drugs is to infiltrate either whole systems in the body or to spread throughout the body, medication allergies may cause issues from rashes, hives, and itching to wheezing and swelling. Although eczema isn’t often included in the “allergy” discussion, it is in fact a sort of allergic reaction -- a chronic skin rash that develops because of an immune system response. It can cause itchy patches of skin that flake off. All of these types of allergies, with the exception of eczema, can also cause anaphylaxis. They do not, however, generally cause itchy eyes. The final -- and most pertinent -- type of allergy is hay fever. When someone says they “have allergies” it is generally a reference to hay fever. Also called allergic rhinitis, hay fever may occur all year long (perennial) or only during a certain season. Common perennial allergens include mold, dust mites, and pet dander. Seasonal allergens are generally pollens from grass, trees, flowers, etc. 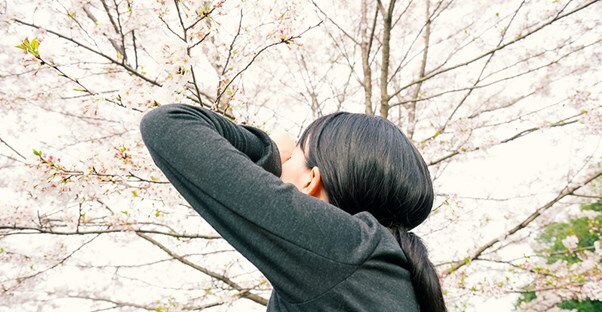 Many people experience allergies during the spring, when most trees and plants are in bloom, thus increasing the amount of pollen in the air. In addition to sneezing, congestion, and itchy noses or mouth, hay fever often causes itchy eyes as well. Just like other allergies, hay fever causes an allergic reaction when the allergen triggers the immune system. Congestion or a runny nose is often an issue because many of the allergens can be airborne. Thus, you breathe in the microscopic particles. They get into your nose; in response, your nose produces a lot of mucus in an attempt to filter out the particles. Likewise, the allergen can get into your eyes. The immune system still detects this as an invasion, and promptly begins producing histamine. In addition to its many other delightful affects, histamine makes your eyes red, swollen, and itchy. Allergens that occur only seasonally can also cause allergic conjunctivitis, a form of pink eye. Conjunctivitis may occur in one or both eyes; in addition to itchiness, it is characterized by redness, swelling, discharge and crusting, a sensation of grittiness, and excess tearing of the eyes. Talk to your doctor about the best way to control your allergies.